UPDATE: AFTER coming down with a deadly case of the flu and being put on life support, young Jaymon Gaul has finally taken a step forward in his recovery. The 10-year-old Chinchilla boy spent about two weeks on life support after what seemed to be a minor cough became influenza, causing a long list of complications including staph, bacteremia and a blood clot. His mother Tasha Millar said her son was able to be taken off life support on Wednesday, which she called a "relief". "He is still fighting hard and still a long way to go but he's improving every day," she said. Ms Millar said doctors had tried to take him off life support earlier this week, but it did not go as planned. Luckily a second attempt worked. "He still needs a breathing machine, so he is on that, and had to start dialysis back up because his kidneys aren't good," she said. "It is pretty much minute by minute because he is still a very sick boy." Despite the long road still ahead, Ms Millar is still staying positive for Jaymon, who was expected to undergo surgery for a staph infection in his leg. "Doctors said he was as sick as he could have gotten on life support," she said. 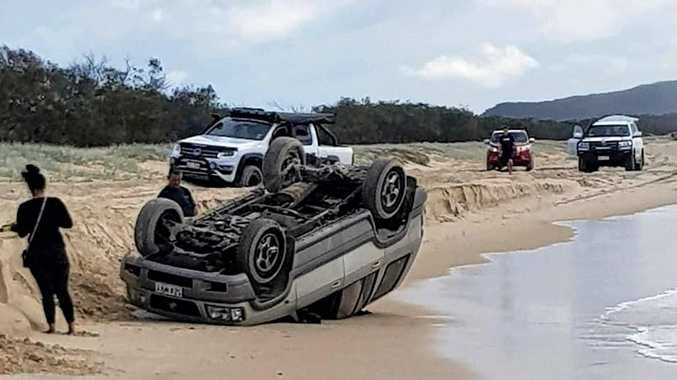 Ms Millar said she was sitting by his bedside at Lady Cilento Children's Hospital, where he has been since he was airlifted from Chinchilla Hospital on September 24. "I always play his music and sit there and hold his hand," she said. "I just talk to him all the time and keep telling him 'mummy needs you' and rub his hair." Ms Millar said she still found it hard to believe she had not heard her son speak in almost three weeks. 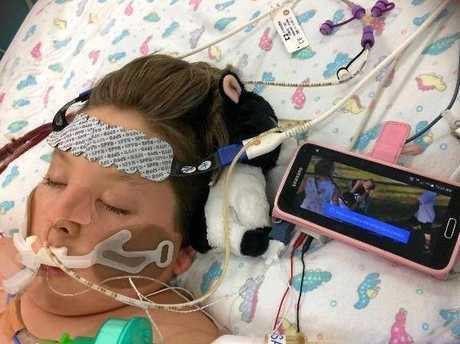 "He had his eyes open two days ago because they brought him out of sedation a little bit to check his brain," she said. "So far his brain is going great. "I know he can't talk but he knew I was there, he kept blinking every time I spoke." Ms Millar thanked the community for its messages of support and donations of more than $3000 via Go Fund Me. SUNDAY: The mother of a young Chinchilla boy put on life support after contracting a deadly case of the flu has finally received some good news. 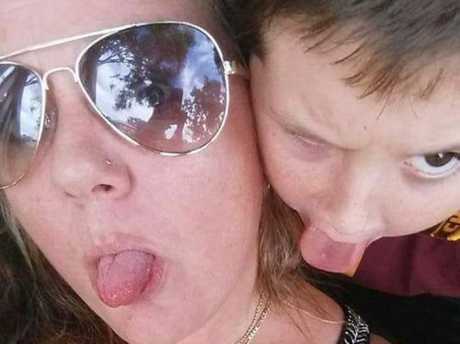 Tasha Millar's 10-year-old son Jaymon Gaul became so sick on September 23 that he was taken to Chinchilla Hospital and quickly airlifted to Lady Cilento Children's Hospital the next morning. By Wednesday the young boy was put on life support and was suffering from both Influenza A and B, bacteremia, a blood clot in his leg, minor brain alterations, golden staph, an enlarged liver and failing kidneys. But today, Ms Millar said she was finally crying "happy tears". "My little man is amazing and so strong," she said. "Doctor just told me all the bugs are gone from his body and hopefully tomorrow he comes off life support and his lungs are looking better. "He will still need dialysis and the breathing machine and to stay asleep for a bit longer but he has fought so hard and he's getting better so fast." Ms Millar said staying positive and strong had paid off. "I knew he could do it," she said. "Nothing can wipe this smile off my face. Thank you Jay for fighting so hard. Like I tell you every day I love you and I need you." Ms Millar also thanked everyone for donations on a Go Fund Me page as well as the messages of support. "Not long now till I can hear his sweet voice and feel his arms around me," she said. WEDNESDAY: A young boy on life support for a week is still fighting hard after suffering from a deadly case of the flu. 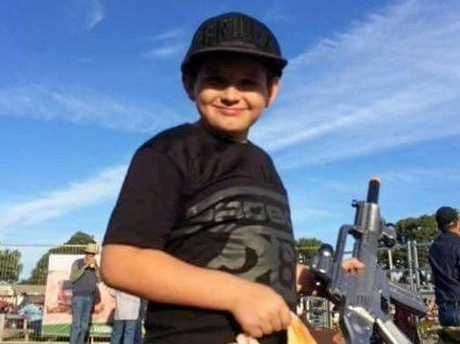 A Go Fund Me page set up for 10-year-old Chinchilla boy Jaymon Gaul has so far raised more than $3100. His mother Tasha Millar said this morning her son was still fighting hard and that she believed he would get through this and the long recovery ahead. "I am so grateful to you all for your kind words and donations," Ms Gaul said. "Jay will be so grateful when he wakes and has his laptop and stuff to mix his music. "I will be using every cent donated to buy what Jay needs and even though the goal was reached I am so thankful that you are still donating. "Which means when he is better and healthier his dream of going to New Zealand will come true. Jaymon was airlifted from Chinchilla to Lady Cilento Children's Hospital in the early hours of Sunday morning and was put on life support on Wednesday after suffering complications from both Influenza A and B. 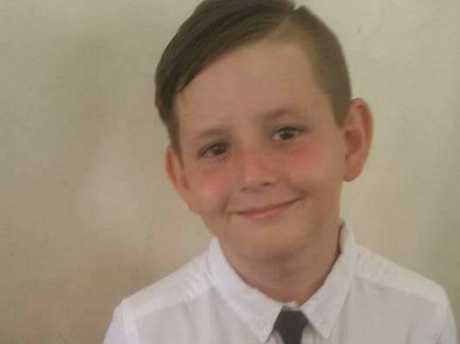 YESTERDAY, 3PM: The family of a young boy struck by a deadly strain of flu is being supported by the community as he continues recovering in hospital. More than $3000 has been given to an online fundraiser to support Tasha Millar whose son Jaymon Gaul, 10, continues his fight for life. 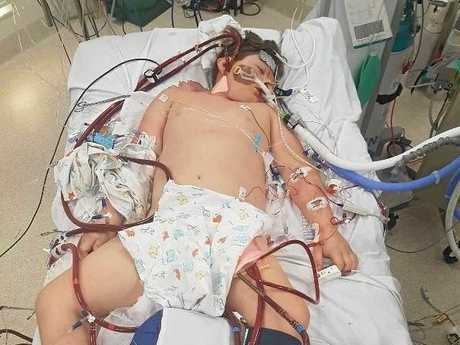 The youngster from Chinchilla was put on life support in hospital just days after he was diagnosed with Influenza A and B and is receiving regular blood transfusions. "Jaymon is still fighting strong," the online fundraiser set up to support his family cover medical costs read. The target of $3000 was surpassed after Ms Miller went public with an appeal to raise awareness about the deadly influenza strain, and also the importance of donating blood. The region has rallied for the family with prayers and well-wishes shared on social media as Jaymon continues his treatments in hospital. As well as influenza, he was diagnosed with bacteremia, a blood clot in his leg, minor brain alternations, golden staph, an enlarged liver and failing kidneys. "Keep strong little man, keep fighting," Nicole Latter wrote. "Poor little fella, best wishes with his recovery, I hope he's home soon," wrote Robbie Ryan. Jaymon's family has been overwhelmed since his story and fight for survival made headlines around the state as stories emerge of the deadly flu strain striking down children. You can support the online fundraiser at gofundme.com/ 5ngcxe-keep-fighting-lil- man-jaymon. MONDAY, 3PM: In just a few hours, Jaymon Gaul went from a healthy 10-year-old boy to fighting for his life in hospital with the flu. His mother Tasha Millar has been by his side since he was airlifted from Chinchilla Hospital to Lady Cilento Children's Hospital in the early hours of Sunday, September 24. Ms Millar said Jaymon suffered a minor cough a week prior to being taken to hospital, but that had gone away. The Year 5 Chinchilla State School student had even been at hospital getting checked over after he was knocked over by a dog and got a sore leg just days before, with no sign of the virus. But on Saturday, September 23 Jaymon's health deteriorated to the point where an ambulance was called. "As soon as we walked in the hospital, the doctor rang the flying doctor to get him out," Ms Millar said. "He was becoming more delusional and his temperature hit 40 and it wasn't going down. He didn't even feel hot, so that was very strange for me." Ms Millar said when doctors told her Jaymon had Influenza, she thought it would mean a drip to administer medicine. But by Wednesday he was put on life support. Along with Influenza A and B, Jaymon has bacteremia, a blood clot in his leg, minor brain alterations, golden staph, enlarged liver and failing kidneys and is on dialysis and had a blood transfusion. "I keep saying I am in a nightmare and I will wake up and this will all be a joke," Ms Millar said. "The main thing I want is for my son to wake up and say 'mummy'. "But I also want people to be aware of how dangerous this flu is. "If I had waited and just thought he was tired and not called an ambulance, he wouldn't be here now. It came on so quickly." As well as warning other parents about the dangers of the flu, she hopes to encourage people to donate blood for children just like Jaymon. Ms Millar is finding it hard to believe how in just a matter of weeks her son was enjoying life, and his favourite thing - music. She is now struggling both emotionally and financially and to make matters worse is recovering from a hip replacement from just six weeks ago which caused blood clots in her leg. "When we were at Chinchilla hospital, he goes 'mummy, do you need anything'," Ms Millar said. "He is always caring about everyone else." Ms Millar said Sunday was the first time she heard a bit of positive news after not hearing her son speak in seven days. Doctors were able to remove some mucus from his lungs and she said Jaymon had some colour in his face. "They (doctors) have to try and prepare you for the worst. But this is the best we have seen him with colour in his face," she said. Ms Millar said she was staying positive for her son, but knows his recovery will be the hardest part. A Go Fund Me page has been set up to help with medical costs and to buy a laptop for him to listen to music on. Go to gofundme. com/5ngcxe-keep-fighting- lil-man-jaymon. Flu epidemic leads to shortage: Tamiflu vaccine in shortage across the state.